I accidentally wiped my Windows 8.1 hdd (DON'T even ask LOL) and now I haven't got my original windows nor my laptop looks like it use to at all. I am going to put an ssd so I would like to bring it to its full glory as I own the best laptop ever but I can't get the full experience as I did when arrived. My system is under the Dell Outlet Warranty. I have tried to find in support a way to get the discs or USB Key but I can't find anything at all and unfortunately I never receive the media with my laptop. Thank you in advanced to everyone. One, if you have a newish Alienware, then call Technical Support. They must be called on the phone, but have always been very helpful to me. Be prepared to prove you own the Laptop. Drivers are on the Dell Site and sorted by which Laptop model you have. Please state which country you are in. Please exactly state which laptop model you have, and someone can give you an exact link to the correct drivers. I contacted Alienware support and all they responded is that a windows 8.1 disc was sent to the previous owner if I want another I have to pay £19 but the copy they sent was only a dell windows 8.1 which doesn't brand the computer and the drivers on the website only makes your computer functional and doesn't give the full Alienware feel. 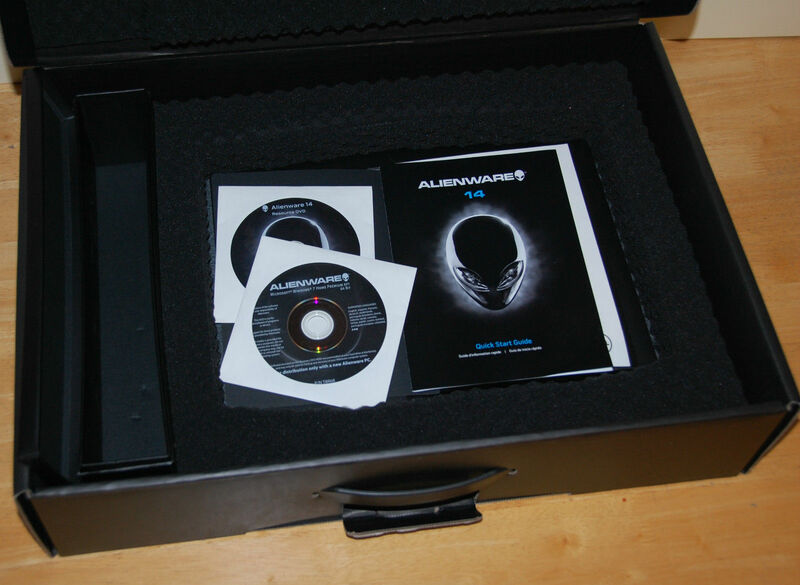 I need the ORIGINAL ALIENWARE CDS WHICH BRANDS YOUR LAPTOP and can be set just as when it came from factory. I found that Alienware was trying to dismiss my request and I am not impressed. DELL PLEASE HELP AS IS A VERY EXPENSIVE PRODUCT WHICH STILLS UNDER WARRANTY AND ENTITLED TO CUSTOMER SUPPORT NOT WANTING JUST SELF HELP. The trick is selecting the correct Edition; the correct Edition will automatically input your Dell OEM UEFI BIOS SLP key and take you to the license agreement screen and the wrong Edition will aks for a product key. Try Windows 8.1 first and Windows 8.1 Single Language second. Thanks but unfortunately that is what I have already and that as said in my posts does not brand the computer and even downloading drivers and wallpapers it will not give it the factory look so what I require is the alienware 14 original recovery and resource disc like the ones on the picture below. My Alien 14 didn't have a Windows sticker in the shipping materials or on the laptop itself. Just a little square sticker that has the Windows Logo and says "Pro Windows 8". Dell software doesn't recognize my laptop and when I try to Activate Windows, it tells me "Windows Can't Activate. Try Again Later". I downloaded BELARC ADVISOR (it's free) and it gave me my Windows Key. If you get your computer going, then create your own reinstall disks. Also write down that Windows Activation Key in several places to keep from losing it. If you go to the Dell Website, and enter the Express Service code or the Service Tag, which are on the back of the computer, then it will lead to a support site with all of your Alien ware drivers, and a page telling you in which order to install them. This is a Microsoft decision, I think, to not include the Window Activation Code on the laptop anymore. You gotta admit, it should help to slow a thief from using your laptop. Also by the time you get your laptop, any original Discs for your computer must already need an update. My local computer shop has a sign that they will not work on any Windows 8 or 10 computer unless the owner provides backup Discs or Back up on a USB key. Or the owner pays to have the local shop create those back ups. This is to prevent their customers going through the hassle you should did, and to keep people from coming back demanding the store restore the OS for free, as the computer shop worked on the computer last. Did you lose your Recovery Partition? Using that, I would think also installs all the right drivers. Even if they need to be updated, I think Dell Digital Delivery handles that on its own. Beware of installing updates to Cyberlink Media Suite. It is a good piece of software, but if you click on update, it will want money from you for the more finished complete product. In my case, I did not give it more money, the update bombed off, and what I had of Cyberlink stopped working, along with Dell Digital Delivery. That is when I go to re-install Windows on my own. If one buys M$ Office from Dell, they will not give you the key later. either keep up with the key for Office, or you may not be able to install it. Supposedly one can get onto the M$ site and register that you have Office, and then you can get it back through the M$ site. I guess the M$ Store. Also losing you login PW can be a bear. M$ is happy to help by keep all the login PassWords for everyone so they can do things from their Store. Hmm. So M$ thinks they are secure enough to have everyone's login PW so they can install whatever software they want, whenever. Hmm.